Fibroblast Plasma is a revolutionary non-surgical, non-invasive targeted skin tightening treatment by using plasma. It is a very safe and effective treatment. 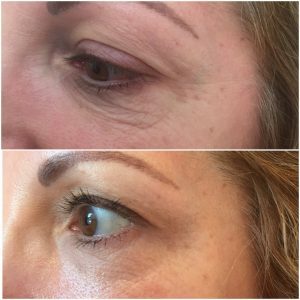 How Does Fibroblast Plasma Treatment Work? Young, elastic skin depends on the amount of structural proteins such as collagen and elastin. These proteins help your skin resist temporary changes such as stretching, folding, or wrinkling. As we age, our bodies produce less of these structural proteins, making our skin more prone to show signs of ageing, such as fine lines and wrinkles. During the treatment, an electrical arching device will deliver heat energy into the skin. This will stimulate the skin’s regeneration response, which helps the skin restore more of its natural elasticity to achieve a firmer, tighter result. Course package available. Please enquire.